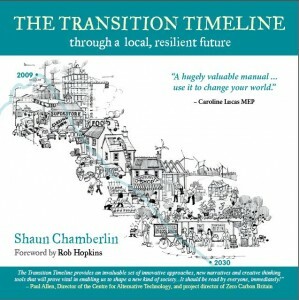 I am very excited to announce that coming very soon is Shaun Chamberlin’s book The Transition Timeline: for a local resilient future. If you liked the Transition Handbook, you’re going to love this too. This is also your first look at the cover, which is the work of Jennifer Johnson, the artist who did the cover of the Handbook. We love it. I will tell you more about the book as we get closer to the publication date of March 19th (it will be available via. this website, among other places), but for now, I’ll leave it to the author himself to tell you about it himself, courtesy of the wonderful Traydio.com, and also the blurb from the advance publicity. You can also download the press release here. “The Transition Timeline lightens the fear of our uncertain future, providing a map of what we are facing and the different pathways available to us. It describes four possible scenarios for the UK and world over the next twenty years, ranging from Denial, in which we reap the consequences of failing to acknowledge and respond to our environmental challenges, to the Transition Vision, in which we shift our cultural assumptions to fit our circumstances and move into a more fulfilling, lower-energy world. The practical, realistic details of this Transition Vision are examined in depth, covering key areas such as food, energy, demographics, transport and healthcare, and they provide a sense of context for communities working towards a thriving future. The book also provides a detailed and accessible update on climate change and peak oil and the interactions between them, including their impacts in the UK, present and future. Use it. Choose your path, and then make that future real with your actions, individually and with your community. As Rob Hopkins outlines in his foreword, there is a rapidly- spreading movement addressing these challenges, and it needs you. The Author: Shaun Chamberlin was born and grew up in Kingston upon Thames. He graduated in Philosophy from the University of York in 2001 and then went on to work on a project for marginalized groups and trained to work as a teacher. Nice, glad I gave that a listen. Look forward to the book. Is there any chance that Transition initiatives will be able to buy bulk copies at a reduced rate as we were able to with the Transition Handbook? Yes, that will be the case, as it will for all future Transition Guides and other titles. For any Transition groups who want to distribute Transition books, Green Books will give the kinds of discounts that they offer to bookshops.